Like most families in the United States, we eat a pretty traditional dinner for Thanksgiving: turkey, stuffing, mashed potatoes, and rolls. To be honest though, I’m never all that excited for the those things. 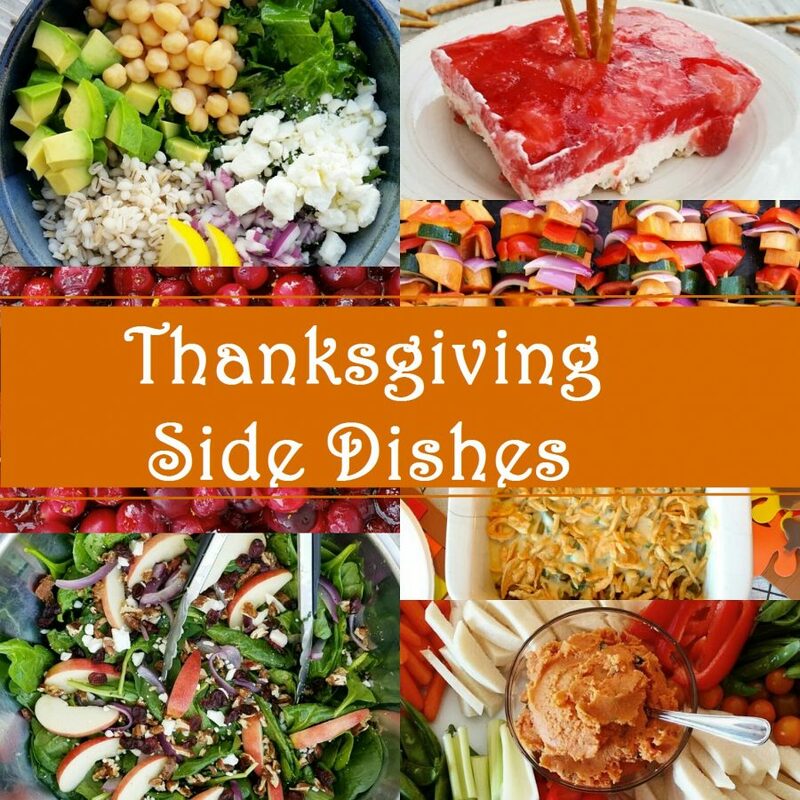 It’s the side dishes I get jazzed up about! Well, and the pumpkin pie of course. Below is a list of the appetizers and sides we love to eat on Thanksgiving Day. I hope this finds you on time as you are doing your last minute meal planning for the big day. Happy Thanksgiving! OK. I recant what I said about the turkey. I do get excited to eat turkey IF it is topped with this amazing Citrus Zest Cranberry Sauce. Frankly, I am a bit embarrassed that I ever used to serve the canned stuff at my Thanksgiving dinners, because this sauce tastes a million times better and takes just 20 minutes to whip up. It can be stored in the fridge for up to three days, so you can make this one ahead of time. All hail the Kale Salad! Who would have thought that a salad made from Kale would be such a hit at the Thanksgiving table? I have made this salad for both sides of my family (my husband’s and mine) for three different Thanksgiving dinners, and each time the bowl is completely empty by the end of the meal. I made a triple batch last year for the Andersen family Thanksgiving dinner (30+ people) and every last bite was gone. It’s the homemade lemon vinaigrette dressing that makes it so irresistable. I actually prefer these roasted vegetables over mashed potatoes on my Thanksgiving dinner plate. 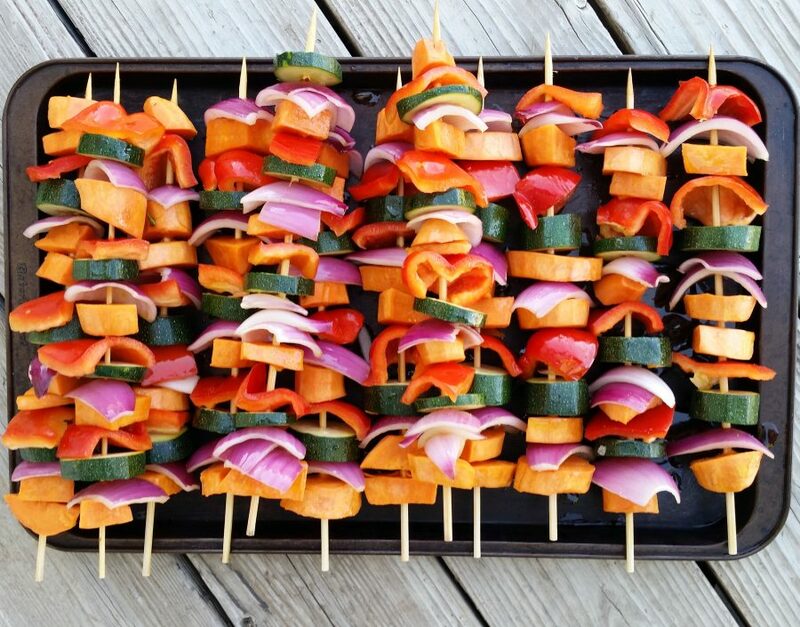 They can be roasted on a sheet pan or grilled on bamboo skewers on the grill. 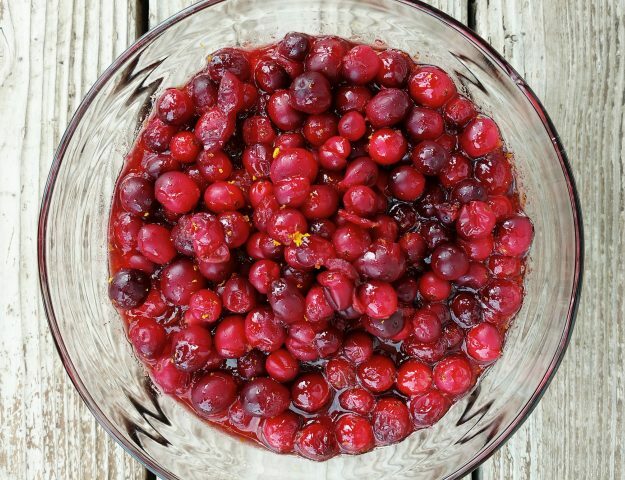 Either way, they have the most amazing flavor and they are a super simple way to add some extra flavor (and nutrition) to your Thanksgiving spread. Our family only eats two meals on Thanksgiving day. A light breakfast after our Turkey Trot and then dinner later in the afternoon. Between those two meals, we graze on appetizers. Some of those appetizers might include my little brothers signature meat balls, my Aunt Cara’s pickle wraps, or just chips and guacamole. 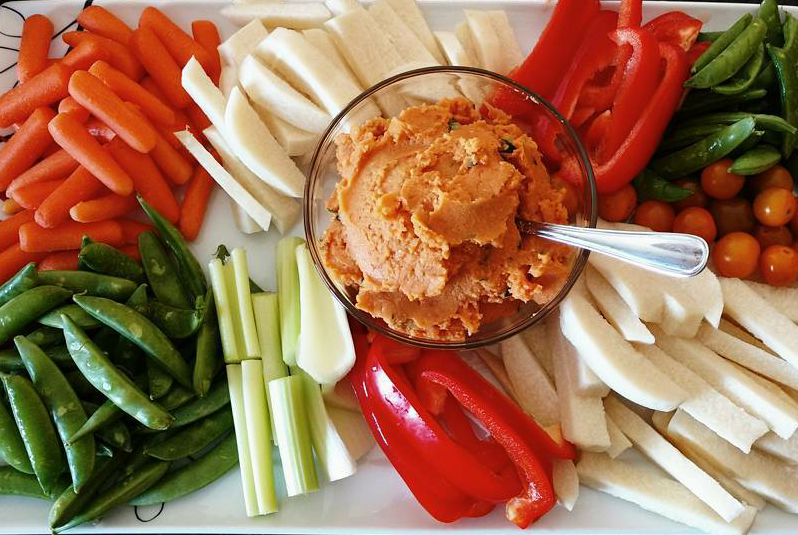 The last couple years, I have started making a huge platter of fresh vegetables served with my Roasted Red Pepper hummus. 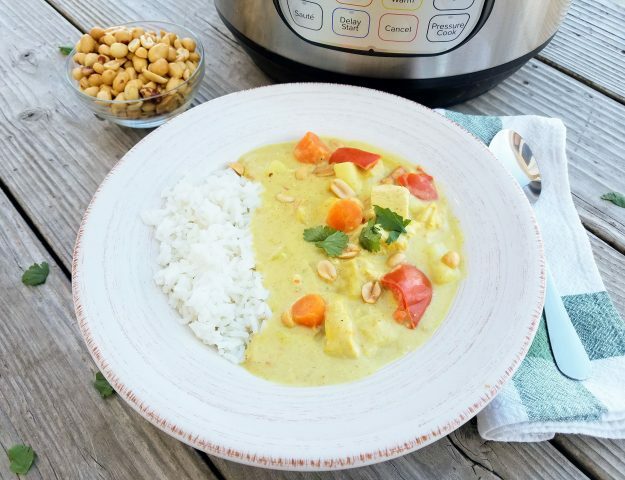 It’s a tasty way to get a little nutrition in before the onslaught of all the comfort foods we love to eat for Thanksgiving Dinner. 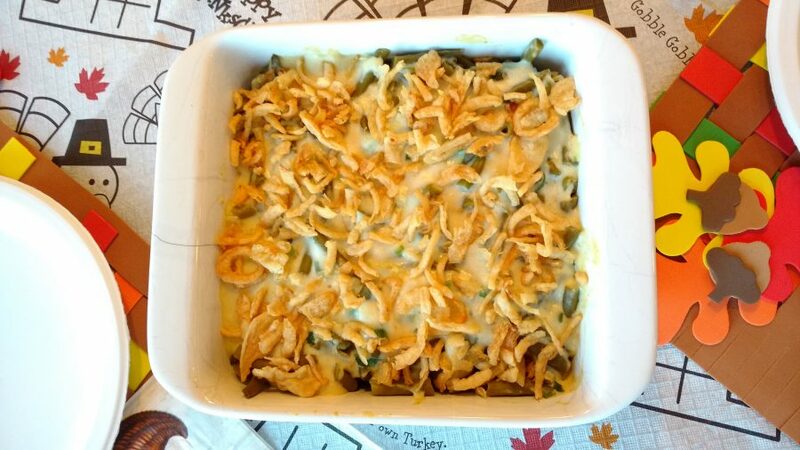 What is Thanksgiving dinner without Green Bean Casserole? I use frozen green beans instead of canned and my homemade cream of chicken soup recipe for the sauce. I bake it at 350 degrees for about 30 minutes. Then, I top it with french fried onions before baking it another 5 minutes. It tastes way better than throwing a can of chicken soup on top of canned beans. 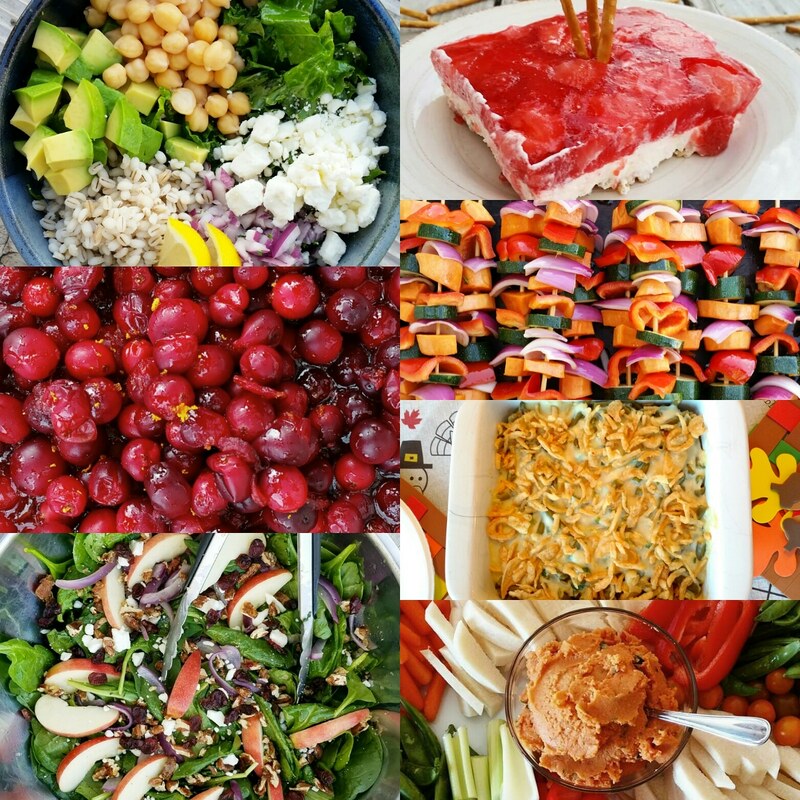 This is as festive as a holiday salad can get. 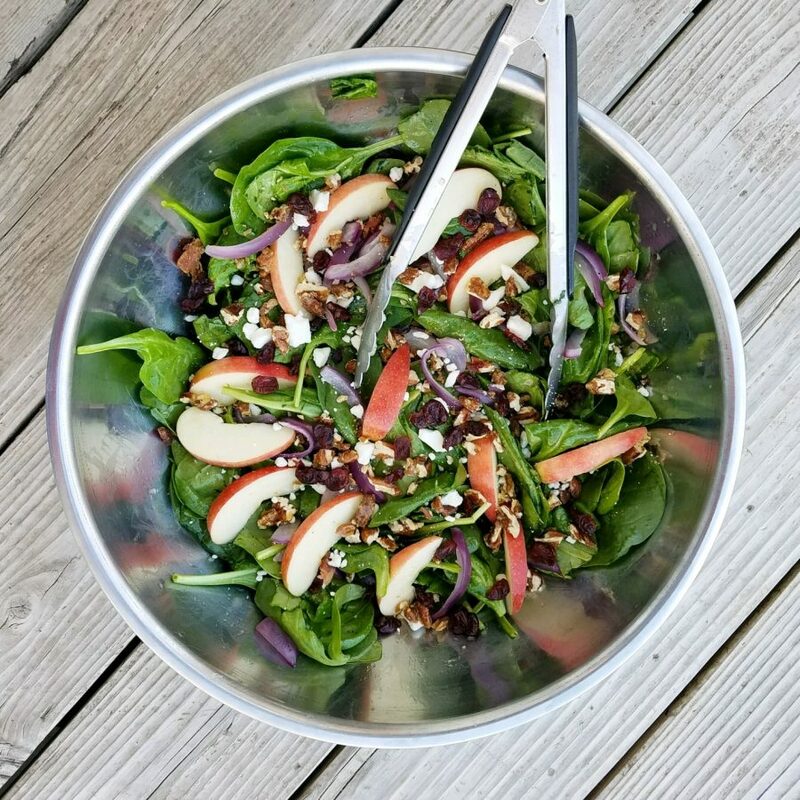 It has cranberries, apples, feta, red onions, glazed nuts, and bacon on a bed of spinach dressed with a yummy balsamic Vinaigrette. Another Andersen family favorite salad. 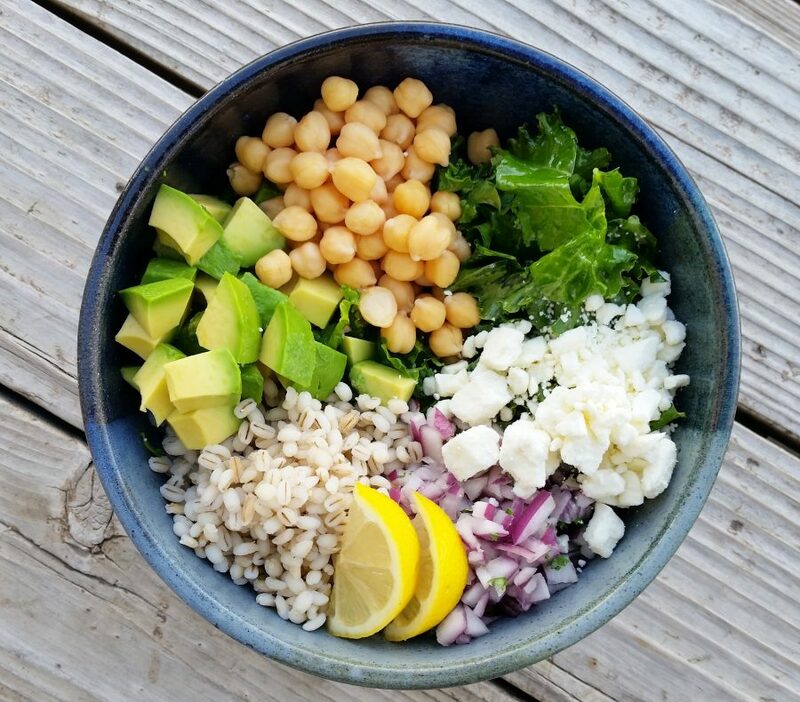 It takes a bit more time to put together than an ordinary salad, but your tastebuds will thank you. You can make the glazed nuts ahead of the big day and save yourself an extra 10 minutes on Thanksgiving day. 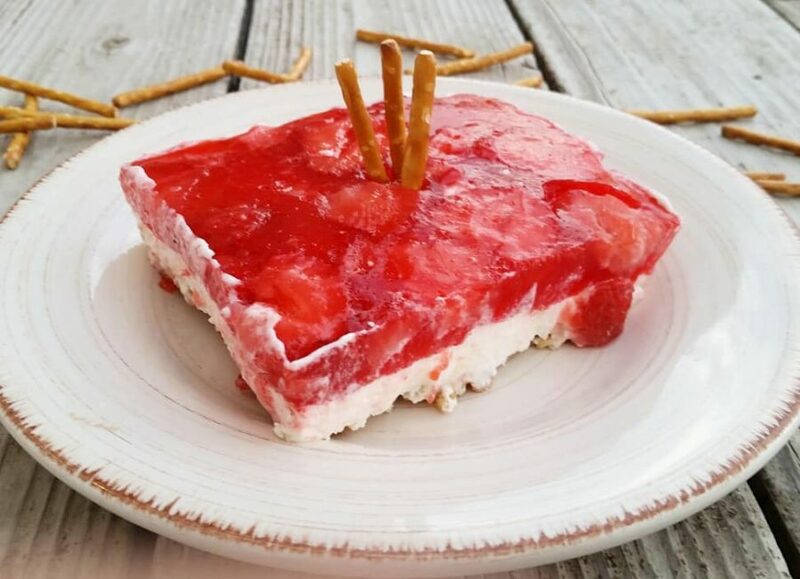 A crowd pleaser and all-time Thanksgiving Dinner favorite is this Strawberry Pretzel Jell-O. My extended family refers to this as “Pretzel Salad.” I just cannot consider this salad. I do however, consider this a must-have dish at Thanksgiving. 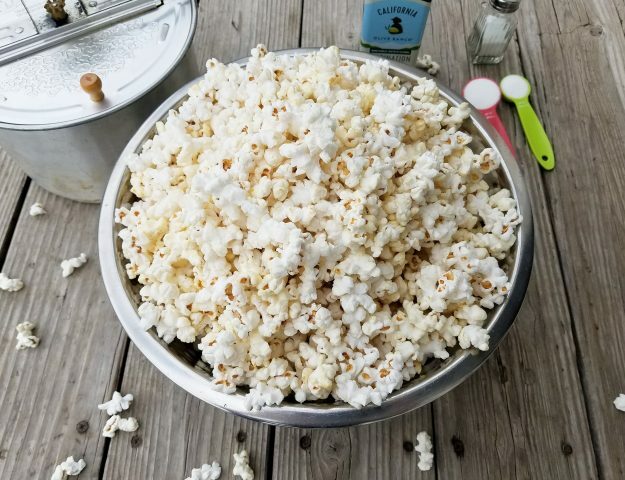 As with almost every treat I make (because this is indeed a treat–not a salad! ), I have found a way to reduce the amount of sugar from the original recipe without sacrificing flavor or texture. Shhhh! Don’t tell my family!! Honestly though, I have been making it this way for years an NO ONE has ever said it is any less sweet. And there you have it folks! 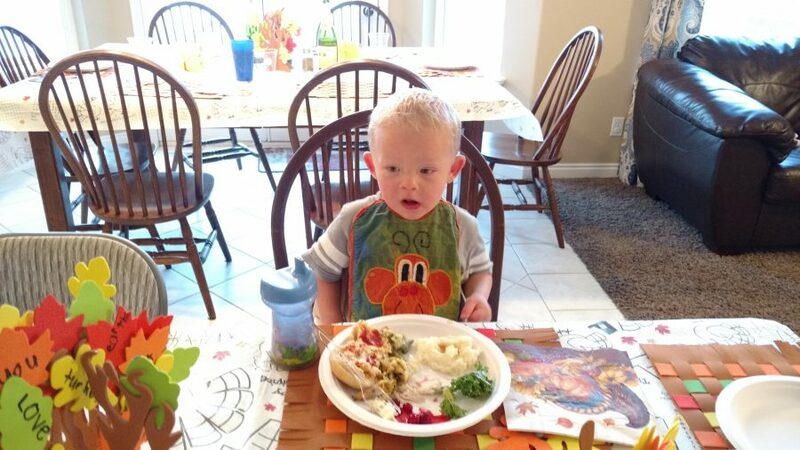 All the Andersen family favorite side dishes for Thanksgiving dinner. I wish you the very best as you cook, eat, play, visit, and share memories this Thanksgiving.